Chakra is the popular term for the energy centres that occur along the midline of the body. They are usually visualised as spinning wheels or vortices of light and colour. According to ancient Vedic tradition, there are seven primary chakras. As people have developed a greater spiritual connection further chakras have become apparent. We work with nine chakras for Wildflower essences. 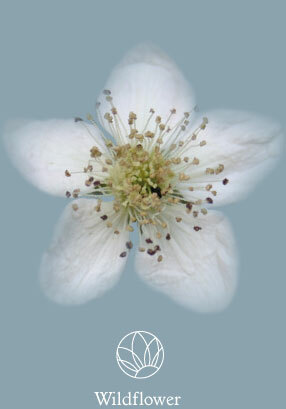 The wild flower and mineral essences can help to activate the relevant chakras. Each chakra corresponds to a different area of the body and an aspect of the psyche. Physical and psychological problems are thought to show up in a person’s chakras and energy field long before symptoms are noticeable. Energy flows in two directions when the root chakra is in balance. The energy flows downward into the Earth and is also drawn up from the Earth. When this chakra is in balance you grow as a person, you adapt easily and go with the flow. When in balance you have a sense of being unique. You have a personal sense of honour and people feel your charisma and integrity. When this chakra is in balance you feel free, emotionally empowered, and hopeful. Of all the chakra meanings this one has the important role of moving ideas into physical reality. When this Chakra is open and balanced you are able to express yourself openly without fear of what others will think. When this chakra is balanced and open you see the world around you without judgement. It is also the place of intuition and psychic perception. Location – At the crown or top of the head. You will achieve a strong connection to higher consciousness when this chakra is well balanced. It is truly the “mystical centre”. Location - Approximately one foot above the crown of the head. It is where past life experience and karmic records are held and the blue print we received from our parents. Its energy is universal and unconditional love. Location - Approximately two feet above the crown of the head. It is considered to be the seat of the soul, where our higher-self resides. Skills and abilities learned from past experiences are held here. Its energy is change, creation and life purpose. This is merely a summary on chakras to support the work of the wild flower essences. There has been much research and development in chakra meanings. If you find support from this area of holistic healing there are further layers to be revealed to gain a greater understanding to this intricate energy system.